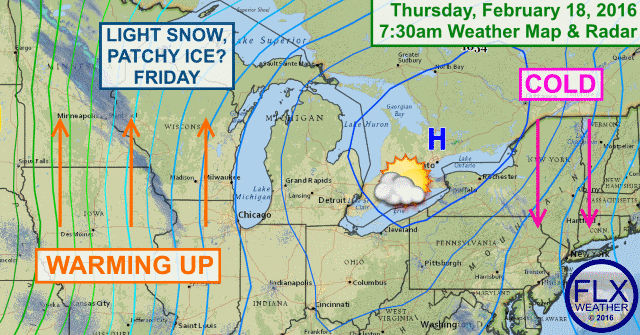 High pressure will deliver a cold, but sunny Thursday. South winds on the backside of the high will bring warmer air to the Finger Lakes. A cold front brought some squally weather to the Finger Lakes last evening. The front is now well to the east of the region and high pressure is building in. Cold air behind the front has settled in for today. Temperatures will struggle to get much past 20 degrees, despite increasing amounts of sunshine. There is a little lake effect snow across the southern Finger Lakes early this morning. This should end before noon as high pressure builds in over head. Temperatures will drop quickly this evening into the single digits, but the return flow around the high will start to bring in some clouds and warmer air after midnight. Temperatures will rise back into the teens by Friday morning and into the low 30s by Friday afternoon. As the warmer air moves in, some precipitation may break out Friday afternoon. Most of this should be snow, but some patchy freezing drizzle may be possible as well. Precipitation will turn to rain showers Friday evening as temperatures rise into the 30s. Saturday is looking wonderful (unless you like winter, then it is quite rotten), with sunny skies and temperatures climbing to near 50 degrees. Sunday will be quiet, but cloudier and cooler with highs near or just shy of 40 degrees. Beyond Sunday afternoon, the forecast becomes uncertain and unreliable. There is an outside chance the region could get clipped by a system over the Ohio Valley with a surprise few inches of snow. Most models, however, currently keep this to our south. A bigger storm, already generating more than its share of hype, is possible towards the middle of the week. This will need to be watched for a few more days before we can start to get a sense for where it may go and how it could impact the Finger Lakes. Don’t buy into the hype…yet.